We are committed to providing an affirming and safe space for LGBTQ+ identifying individuals to be seen, heard, and understood. The LGBTQ+ population faces unique challenges related to gender, sexuality, and identity. It’s hard to shake deeply held negative beliefs about yourself, even more so when you are raised in an environment where you are not appreciated or respected for who you are. You may even feel you’ve spent time living a lie or having to hide your true self. Therapists on our team are self-aware, reflective, and informed. We advocate for understanding, awareness, and social change by challenging biases of hetrosexism and binary gender norms. 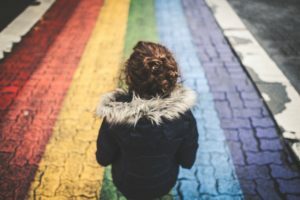 Even when the issues brought to therapy may have little to do with your gender or sexuality directly, your LGBTQ+ identity may be the source of stress due to stigma and discrimination. We consider the ways your presenting issues may be impacted by your LGBTQ+ identity, and help you embrace all parts of yourself while you work to improve your relationships. Our goal is to make you feel better by replacing old or unhelpful patterns of behavior with new ones that will serve you better. You are beautiful the way you are, and one of our caring therapists can help you to learn this truth for yourself. Email or Call if you have questions or would like to schedule an appointment!